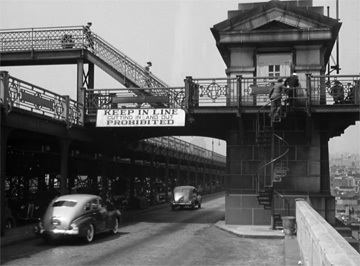 Naked City is a beautiful and curious artifact, especially if you're locked into the little New York City bubble of self-regard (as I am, along with most of the bloggers I follow). 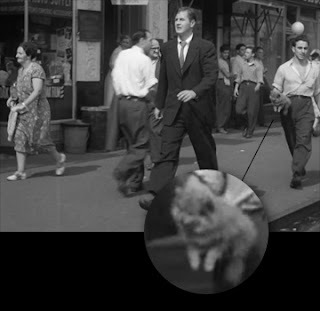 It's curious because of the tangible resonance of each scene, the strange alien familiarity of each city-street sequence. 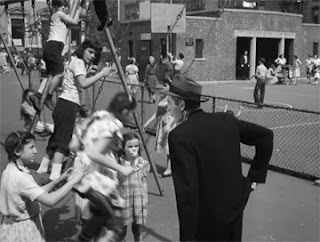 Simply writing about it -- waxing prosaic about the soul of the Big Apple, by way of an obscure silver-age film noir -- would have gone beyond even my own limit of self-indulgence, so instead, I looked for the beauty and strangeness in the frames themselves. You can find those below. A lot of what's worth noting is also kind of funny, at least to me. 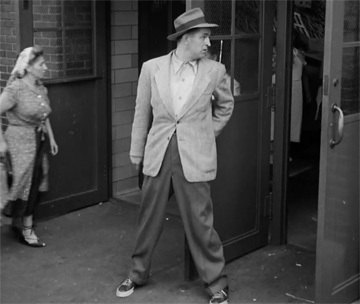 It's worth noting that LA Noir, the recent electronic entertainment offering by Rockstar Games, was partly inspired by The Naked City. Funny that they repurposed the personality to be so West-Coast, when the film itself prides itself on being NYC Vintage. Still, you can feel the gamer spirit here, as well, with its exploratory pace, its chain of tasks and obstructions, its puzzles waiting to be assembled and unlocked. All the accented side-characters may as well be NPC's, and sometimes the dialog feels like it was written to be repeated to every passer-by. Go looking for the film, by all means, but don't expect anything groundbreaking from the story itself. It's a detective story reduced to its most predictable beats. Instead, watch it to see this police procedural narrative, these tricks and twists and technicalities, just as they're being repackaged for drama and turned into mythology. Also, watch it for the details, the things the filmmakers probably didn't realize would be noteworthy, some of which I've presented below. 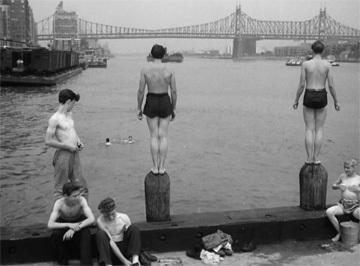 In the 1940's, boys did a lot more swimming in the East River than they do now. Is this because 1) it was cleaner? or 2) they weren't as worried about the constant stream of refuse? Have you EVER seen this many kids playing on a swingset at once? There's a girl standing up on her swing, and a little boy climbing way up one of the poles. I doubt I've ever seen as many kids in a whole playground as Detective Halloran is currently interrogating on that swing set. 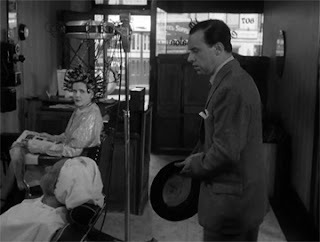 Throughout all of recent history, salons have been the testing-grounds for alien brain technology. In the 40's, it was less big plastic bubbles, and more wires and spark plugs. It's not completely obvious from this photograph, but this blind man's seeing-eye dog is also an attack dog that mauls anybody who bumps into him -- as Willy Garzah is about to find out. Speaking of Willy, you can tell he's an athlete and an acrobat, because he's the only guy in The Naked City who wears sneakers (Vans? Chuck Taylors?) with his three-piece suit. 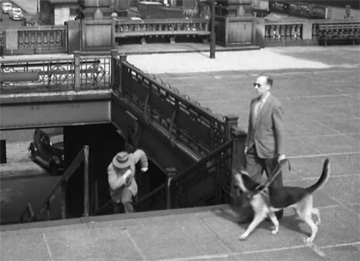 But finally, after all these familiar scenes and nostalgic moments, my favorite detail in the film: as Detective Halloran is chasing Willy, this random dude appears behind him, walking the same direction, and carrying a Pomeranian that's apparently too lazy to walk. It's nice to see that some things never change. Those were great point outs. I absolutely love the old black and whites in this.